Yeah, Joe. Being from Pa., where the truck was previously titled, I know from experience the people in Harrisburg don't like looking into the old, hand files, to verify anything. I'm guessing, much like you, the previous owner, who had had the truck for many years, had permitted the title to expire and lost it. When he went in to re-register it, he just assumed it was a 48 because it looked like one. How do you vin number a custom chassis frame ?? I was just wondering if you knew what the best way is to put the vin number on my newly created custom TCI frame ?? Does someone offer a kit or info on the best way to vin number a custom chassis ?? There is certainly no "kit" that will give you a VIN for your truck. New, aftermarket frames should come with a Manufacturer's Statement of Origin (MSO), just like any new car, that proves its legit origin. You take that paperwork, along with your current vehicle title and your completed truck to a DMV or State inspection site and they will look over the documentation, make sure nothing is stolen, and either transfer your current number to the replacement frame, or issue you a totally new number. Your state authorities are the only ones legally allowed to stamp frames or issue VINs. Do not attempt this at home. You can buy stamps or punches with all the alpha-numeric characters, but I thought custom frames came with a serial number. Ford has, for years, used the fame as their primary serial number location, so, the new frame would create a new serial number. I did a quick search and this has been the topic of discussions on a couple of sites. I did not, however, see a solution. I would contact the local DMV for their guidance. Looking at the TCI site didn't offer much help either. I have to agree with Wayne and should have cautioned, do not try to create or place your own serial number. Here is my contribution to the database. Frame and VIN numbers match. Attached is a copy of my original title from 5/13/1983. This is a Correction title, as the BMV screwed up an earlier one from January or February of the same year. This seems to be a habit of Indiana's Bureau of Motor Vehicles. Two years ago, I had to apply for a lost title, as the one in the photo could no longer be accepted. Seems some moron mis-entered the year of manufacture when the state went to a computer database, and had the truck listed as a 1979. So now, I have TWO titles for the same truck. At least I can definitively prove I own it. Well, I did attach the title, but had to remove the photo as it had some info I didn't want on the Web. Suffice it to say, on that title was the mileage when I got the truck, and it is listed as 66,000. I don't know where you got that number but it is NOT a valid serial number. I'm selling this 48 F2. The serial number on the metal tag on firewall matches the frame stamp. I can't really read the rest of the tag as the black is washed off. The firewall stamp is weird. First character looks exactly like a backwards 3 then HP23K. After reading enough info I'm thinking 8 for 1948, 7HY for 226 and which one off assy line? I found a flat 6 and trans from a 48 for sale. I'd like to get rid of the Old's V8 that's in it. So it's an F3? Weird because other than the engine swap it doesn't look touched. It has F2 badges, 16" Innies with hub caps, and rear shocks. Does NOT have the 14" rear drums. Also evidence it was column shift. 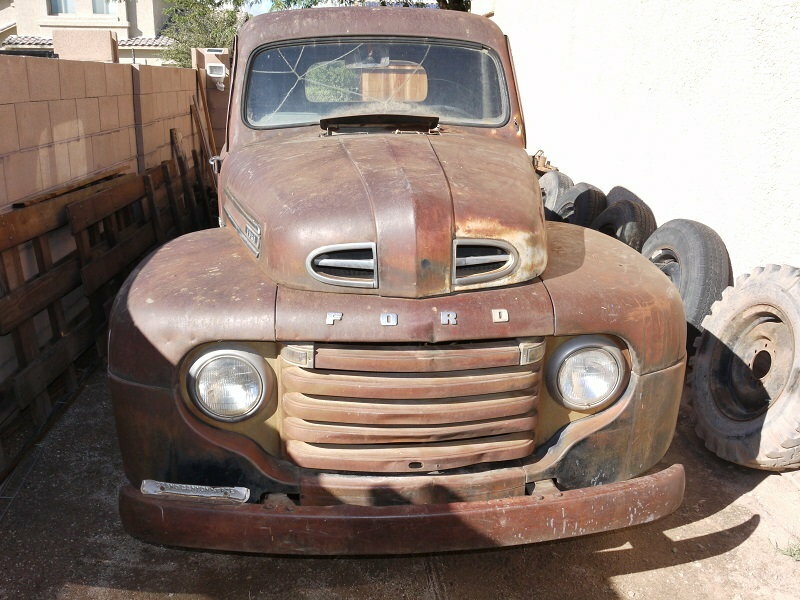 I don't know the original owner other than he was a rancher on outskirts of Tucson. The second owner got it when he got out of Viet Nam and it has sat ever since. AFAIK the F1 was the only truck available with the Remote (Column) shift prior to 1953. Column shift was a running change addition for the light duty 3 speed in the F1 toward the end of 1950. I believe we've seen other early F2's with the Y designation in the serial number instead of D. Not unusual. If you see enough evidence the truck is original as is, it probably is. I suspect the "evidence" the truck was column shift is that the top of the steering tube has the anchor for the shift tube, or the trans cover has a crudely cut hole for a floor shift? Either part could be a replacement.